Recently we were invited by our long time friend Rob Wood of Spoutwood Farm Center to a local farm to table dinner put on by Dickinson College Farm. Dickinson College Farm is a 50 acre working and educational farm that is certified organic. The harvest is used in the dining hall and the farm has a Campus Supported Agriculture Program which feeds 130 families. In addition, they maintain a farm stand at Carlisle's producer-only farmer's market and donates produce to the local food bank. In addition to visiting with organic farmers in the area like our friend Rob Wood and Mike Brownback of Spiral Path Farm we were treated to a fabulous fresh local food dinner. This annual event was held in the social hall of the Dickinson College student union. The tables were set so pretty we didn't feel like we were on a college campus at all. The extensive menu featured organic, local, fresh ingredients from the vibrant agricultural community of Pennsylvania. The soups and salads included Kale and Apple Salad, Fresh Mixed Greens Salad, a thick delicious Vegetarian Chili and a yummy Vegetarian French Onion Soup. Above is the "Beet Bourguigon" one of the entrees along with Apple Stuffed Pork Loin. Side dishes included Rustic Mash Potatoes, Stuffed Mushrooms, Roasted Root Vegetables and for dessert Sweet Potato Pie. Following the meal we enjoyed a program presented by Forrest Pritchard, a Berryville, VA farmer and author of Gaining Ground his story of farmer's markets, local food and saving the family farm. This darling little tea ornament was a surprise gift from a good family friend and frequent tea room guest. It's always such fun to receive a sweet remembrance for no particular reason except that she was being thoughtful and knew it would be perfect for my tea tree. Such a fun souvenir from the Charleston Tea Plantation in South Carolina. Thank you for thinking of me, JP! is from one of her fine cookbooks. that really makes spring salad greens sing. Combine ingredients and blend or shake together thoroughly. Guest Post By Lindsay del Carlo, Trial Garden Manager of Renee's Garden Seeds. Renee's Garden Seeds are available at The Rosemary House (scroll down the page). You don’t need to have a fancy set up to successfully grow your garden seedlings. Many people have that one cabinet or drawer full of plastic containers that have lost their lids, a stack of yogurt cups that have long been forgotten or the clear plastic "clamshell" containers that you’ve kept around, and maybe an empty plastic milk jug or two. Disposable containers can receive new life by using them to start seeds. Containers that are about no more than 3 inches deep are perfect for seed varieties that will be sown close together and then transplanted. I am using these to grow tomatoes, eggplant, peppers, basil and spring flowers like calendula, bachelor buttons, Agrostemma, and Clarkia. This will insure that I’m able to scoop up all of the roots with minimal damage when transplanting. 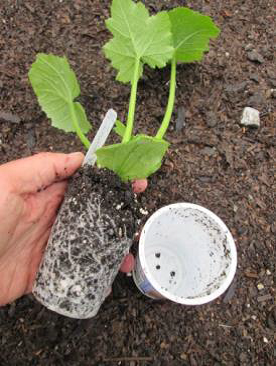 Small yogurt cups work perfectly as individual containers to sow large seed varieties like pumpkin and squash. Food and yogurt containers or milk jugs with their bottoms cut off will need to have drainage holes. Use a drill with a ¼ inch bit to put holes in the bottom of the containers every few inches. Clamshell containers of store bought produce often already have holes in them, so this makes them very convenient for sowing seeds. These also have a lid that can be closed to hold in moisture when weather is warm. Milk jug bottoms make good starting trays; Drill small drainage holes every few inches. Clamshell containers usually have drainage holes and a lid to hold in moisture. The zucchini and pumpkins have grown perfectly in yogurt cups. When the roots completely fill out the cup, they will be transplanted directly into the garden. Tomato and pepper seedlings all need to be transplanted into larger individual containers when they have several sets of true leaves. Yogurt cups are the perfect size for them. When the night temperatures are above 50°F (10°C) it will be time to move them outside to harden off, and then plant into the garden. Radiance is the shop portion of Sarah Preston's Herbs from the Labyrinth business. Located in Lancaster, PA just across the cobblestones from Lancaster's Central Market, Radiance is her retail outlet. I have known Sarah for years and was very happy to finally visit her cheerful shop. A Community Herbalist she sells the herbs, tinctures and oils as well as creates many of her own herbal teas and formulas. In her cram packed gift shop she carries gift items, baskets and hand dyed clothing as well as Spiritual books and gifts. There was so much to see and we had a fun time poking around. She also has quite a large lending library available to her customers. And she has bodywork rooms for massages or Reiki. This is the tranquil and open classroom space where she will host music, yoga, herbal workshops and many other teachings. Below is a close up of the altar space she created. On our recent trip to Lancaster, PA we were able to do a really quick run through in the beautiful Lancaster Central Market, billed as the country's oldest continuously operating farmer's market. Veggies, Meats, Cheeses, Breads Oh my! The variety of fresh mushrooms was super fun. Of course the herb shop caught our eye with a huge variety of herbs, spices, pastas, dressings, and more. And the very busy tea bar. We would have enjoyed sampling one of their special teas, but since we were headed to our Fundraising Tea event, we just admired their interesting booth. Not to mention the fresh herb plants, pansies, and a promise of spring. This place was bustling and a real treat! We recently attended a Chocolate Lover's fundraising tea held at the Miesse Candies chocolate factory in Lancaster, PA. Owner Tracy Artus is in the running to be elected Woman of the Year 2015 for the Leukemia & Lymphoma Society. This 10-week fundraising effort included this special tea coordinated with La Petite Patisserie. We gathered in the candy shop until the other guests arrived. Easter candy was in abundance, and temptation was great. As we were ushered into the factory, although the machinery was still, the delicious fragrance of chocolate was heavy in the air. Pretty fresh flowers graced the tables, and an array of chocolates and caramels tempted us. Established in 1875, this business has been keeping Lancaster supplied in quality chocolates, candies and caramels for 140 years. Tracy and her husband are the most recent owners, having purchased the business four years ago. They are keeping the candy tradition alive! There were three seatings on this chilly Saturday in March. Rental tables and chairs gaily covered in yellow tablecloths and draped with pretty blue runners covered the tables. We were eager to enjoy our Chocolate Lover's Tea! Tracy spoke briefly about the history of Miesse Candies and also about her quest to raise funds for the Leukemia and Lymphoma Society. We were offered a variety of teas served in individual little pots that included Chocolate Raspberry, Vanilla, Chocolate Chai, and Earl Grey. Promptly after the tea arrived, we were offered a Cream Scone. The toppings for the scone featured a very thick, rich chocolate ganache and seedless raspberry jam. The sandwiches were served on a variety of serving trays. Our clam shell server was laden with a variety of sandwiches that included a Classic Cucumber Tea Sandwich, Egg Salad Cups with Shallots & Parsley, Pate a Choux with Creamy Pepper Jelly, Sweet Potato Puffs, and Turkey, Spinach & Bacon Pinwheels. Dessert featured chocolate... and in addition to the beautiful plate of chocolates already on the table, we were offered either a milk, white, or dark chocolate covered strawberry, a delicious chocolate mousse in a dark chocolate cup, and Almond Frangipani Tarts. Willy Wonka Cedar and the Chocolate Factory! Golden Tips Tea in New Delhi, India, recently sent me a wonderful box of assorted tea samples including these three unique single estate Darjeeling samples. This 4th generation family business takes pride in the teas that they grow, harvest, dry, and sell. Darjeeling teas, known as the Champagne of Teas, must be grown in a specific north-east region of India in order to be labeled Darjeeling. According to the packaging, recommended brewing suggestions for Darjeeling is 1 tsp./cup, 194 - 212 degrees, for 3 - 5 minutes. Typically, I use boiling water (212 degrees) and opt for the longer steeping time of 5 minutes. As you can see, the tea produces a nice lightly colored, somewhat thin brew. There are delicate natural floral undertones detected with each sample. The Thurbo Moonlight Darjeeling is a Second flush summer season sample from the Thurbo Estate. The dry leaf has an abundance of silvery tips throughout the package of large wiry brownish black leaves. The golden liquor yields a naturally sweet and delicately floral flavor. The Gopaldhara Gold Darjeeling is a Third flush and yields a slightly darker brew in the cup. This tea was picked as recently as November 2014!The large black leaves have silvery tips throughout, and after brewing you can discern some stems and larger tea leaf pieces in the wet leaf. To my palate, the floral notes in this tea are not as present as the Darjeeling from the Thurbo Estate. The third tea sampled is the Arya Ruby Darjeeling from the Arya estate. The first flush, or picking, begins in March and pushes through to April. As noted, this tea was picked in April of last year. Hints of green can be spotted on both the wet and dry leaf. This appears to be a larger leaf also. This tea is light in flavor with subtle hints of green without any astringency noted. This was a fun variety of Darjeeling teas to sample. A special thank you to Golden Tips Tea for sharing their harvest. These teas may be ordered online from Golden Tips, with free shipping to the US when you purchase $49.00 worth of tea. Or, for first time customers, they are offering a Sample package for $15.00, shipping included! Follow this link for details. We welcomed Julie Pellegrino to Sweet Remembrances and The Rosemary House this past St. Patrick's Day for a presentation on Celtic Mythology. Before the program began, we served an afternoon tea platter that included a Rolled Asparagus Sandwich, Miniature Toasted Reuben with Corned Beef, Sugared Green Grapes, Herbed Spinach Bread, Irish Soda Bread Scone with walnuts, golden raisins, and caraway seed, and a Mint Frosted Cookie. Although the Irish prefer a very strong hearty black tea strong enough for a 'mouse to trot upon', we served a variety of green teas in keeping with the green theme of the day. Tea is enjoyed in Ireland on a regular basis, not only as their beverage of choice, but also as medicine and as ritual. It is consumed with all meals as it aides with digestion, and is enjoyed in the late afternoon for a pick me up. The Irish are known to drink more tea per capita than the rest of the world, including the British. Hope your St. Patrick's Day celebrations were happy ones! My morning started with a hearty Assam from Golden Tips Tea. This premium single estate tea, named for the growing region in India where it is harvested (Assam) is particularly bold and full bodied with a lingering astringency to the tongue. A deliciously fragrant honey-note emanates from the package when it's opened. The packaging contains important information, including the picking date and brewing recommendations. I can visualize the women in the tea fields harvesting this beautiful Assam, a second flush, or second picking of this tea. The first flush is typically harvested in March, while the second flush is harvested during the summer season. Dry leaf tea compared to wet leaf. ﻿﻿In the photograph to the left, the golden tips are easily spotted.The second flush will have an abundance of golden tips and is generally considered superior to the first flush tea. A sweeter, full-bodied, and malty flavor is associated with a second flush Assam, and this tea has it all. The beautiful dark tea with golden tips throughout provides a dark liquor in the cup which makes it a perfect choice for a morning pick-me-up-and-get moving tea. Because it is such a hearty and bold tea, it takes the addition of milk and sugar perfectly if you prefer. We also found this tea to be quite delicious iced. This past holiday season we served Carrot Cake Tea Sandwiches to rave reviews. Many of our guests often inquire as to where we find our recipes. The recipes come from a variety of sources to include old and new cookbooks, tried and true family recipes, magazines, tea books that specialize in afternoon tea, and Tea Time Magazine. The Carrot Cake Tea Sandwich appeared in the November/December 2006 issue of Tea Time Magazine and you can also find the recipe posted online. In creating my menus and selecting sandwiches, I try to select a variety of shapes, different types of bread, and pleasant flavor combinations. This recipe is prepared with Raisin Bread, offering a sweet addition to the plate of tea sandwiches and a nice contrast with the bread. With written request, the staff at Tea Time Magazine has graciously permitted us to share the recipe. With spring right around the corner, these would be perfect for the Easter tea table. In medium bowl, combine cream cheese, carrots, confectioners' sugar, and pecans; stir to mix well. Spread cream cheese mixture on half of bread slices. Top with remaining bread slices. Cut sandwiches into fingers. Preheat oven to 300 degrees. Line 36 miniature muffin cups with 1-5/8” paper cups. Combine all of the Chocolate Crumb Crust ingredients until well blended. Press 1 tsp. of the crumbs into the paper lined cups. Press crumbs down with tamper. Set aside. In small bowl, stir together melted butter and cocoa powder. In large bowl, beat cream cheese until fluffy; beat in cocoa/butter mixture. Gradually beat in sweetened condensed milk. Beat in egg and vanilla. Divide mixture evenly into the prepared muffin cups, filling the cups to the top. Bake in 300 degree oven for 13 minutes, or until set. Let cool in pans for five minutes. Gently remove from pans. Prepare Chocolate Glaze. Melt chocolate chips. Add whipping cream and vanilla. Stir until smooth. Spoon a generous teaspoon of the glaze over the top of each cheesecake. Refrigerate several hours, or overnight. Prior to serving, remove muffin papers. If desired, top with sweetened whipped cream and chocolate shavings. To S.Franks! You are the winner of our giveaway for a copy of The Perfect Blend. Please contact us with your mailing address, and we'll get this in the mail to you. Congrats! The Perfect Blend, published in 2010 by Harvest House Publishers is an easy-to-read romantic novel by Trish Perry that prominently features a tea room. Steph, the main character finds herself in a difficult position when her fiancé leaves her standing alone. She connects with several characters throughout the book, including the tea room owner where she finds temporary work until she lands on her feet. In the meantime, a friendly romance begins to develop with one of the towns eligible bachelors. Steph discovers herself, her connection to family and friends, reevaluates her relationship with the fiancé when he returns, and relies on faith and prayer to make the right decisions in life. There were plenty of interactions in the tea room including prepping for the tea service for the day. In the back of the book there are a few recipes for some of the food that is served in Millicent's Tea Room. This book is the first in the tea room series by author Perry. If you're looking for a fun clean read, curl up with a mug of tea, and enjoy the unexpected turns that are part of life's journey for Steph. If you would like to be included in a Giveaway for a slightly used copy of this book and a few tea samples to enjoy with it, leave a comment on this post now thru Sunday March 8th. Winner will be announced Monday the 9th.